From BCR - "Distributed by Derek Butcher in Australia as WT10234. 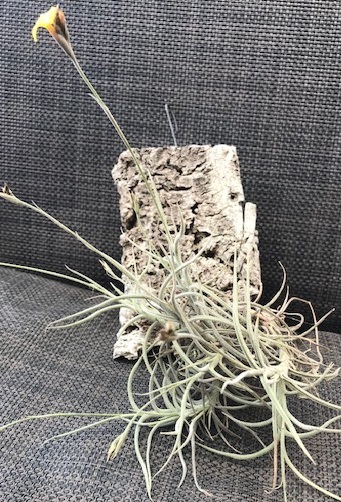 However it differs from the plant as recorded in Austria as Tillandsia virescens and now has this cultivar named after Assoc-Prof. Dr. Walter Till of Vienna University. Plant offsets freely, each individual plant is up to 125mm long, which includes the old dried base / stem. Leaf blades are 45mm to 55mm long and about 2mm to 3mm wide. Flower spikes are between 65mm to 110mm in length and yellow petal blades measure 8mm to 12mm wide. From Argentina. 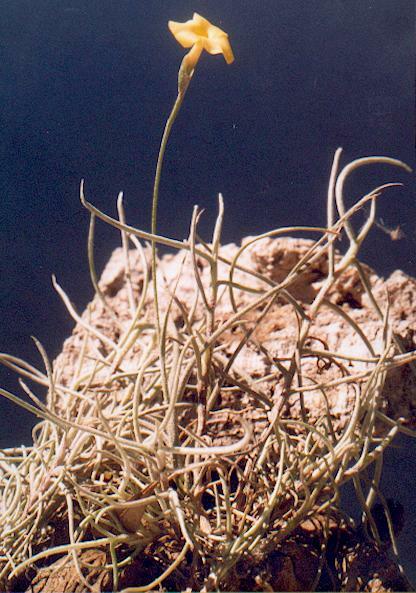 In 1994 Walter Till sent me a large collection of Diaphoranthema plants because he knew I was keen on this subgenus of Tillandsia. They grew well and when I had queries about identity I sought Walter’s opinion except for one – WT10234. This had T. virescens on the label but had a large yellow flower like T. crocata. Was it a natural hybrid? It grew well and I handed out several offsets to interested parties. In November I got an excited Email from Ray Clark that he had flowered his plant. After 20 odd years of indecision the time seemed to have arrived for decisive action. So I wrote to Walter Till and he advised he collected WT10234 and details on his records are as follows. of Amaicha del Valle along the road to Tafi del Valle, near Los Corpitos, 2900 m s.m. 13 February 1993 leg. W. Till 10234 on perpendicular conglomerate rock. He then said that vegetatively this is the same as the photo I had sent of ‘My Plant’ but the flower is really surprising. 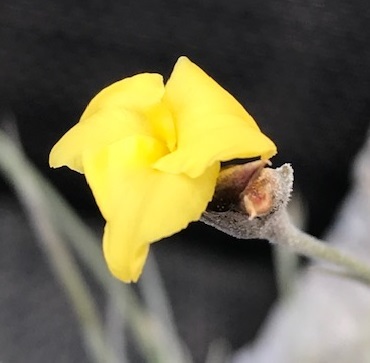 He had found a slide of this collection which flowered in their greenhouse on 4 March 1994 (= one year after collecting) and it has brown petals not much larger than usual, the floral bract is distinctly surpassing the calyx. This confirmed that the piece/s held in Vienna were T. virescens! He then said he would not exclude that my collection is one parent of an artificial (or accidental) hybrid. If I wanted to give my plant a Cultivar name, then go ahead. There are yet more possibilities where the label could have been misplaced on importation, or the clump that Walter collected was a seedling grex rather than offsets from the same clone. From an Australian point of view it is safer to link WT10234 to ‘Walter’ than T. virescens. 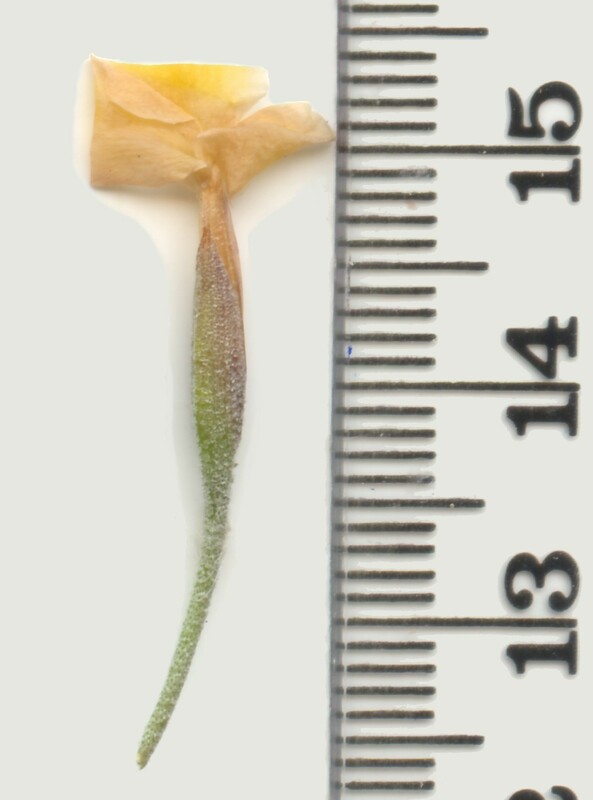 Plant offsets freely, each individual plant is up to 125mm long, that includes the old dried base / stem, leaf blades are 45mm to 55mm long and about 2mm to 3mm wide, flower spikes are between 65mm to 110mm in length and yellow petal blades measure 8mm to 12mm wide.